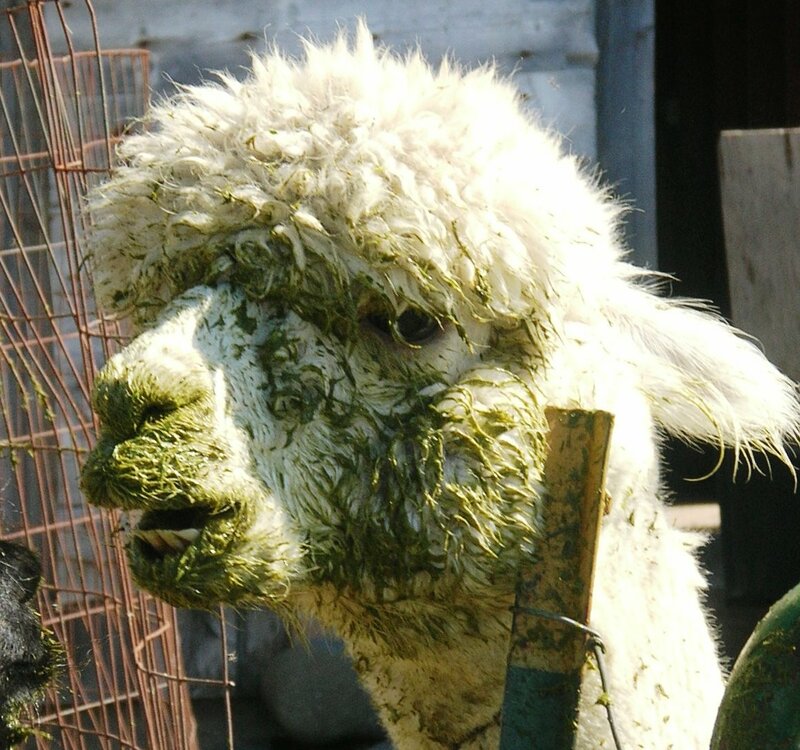 It is always the question— do alpacas spit? Well here is proof, yes they do! This is our beloved stud male, Sugar Ray, often more dog like than alpaca like. He enjoys car rides and a good scratch behind the ear. He has been with us for 11 years, having been born the same year as our son. Sugar Ray, however, is not a good listener. He especially doesn’t like to take no for an answer from the ladies. When all the girls have been bred and are pregnant they repel the advances of a male by spitting and running. On this day, an altercation occurred at the fence line and Sugar Ray simply would not back off. Thus, a head full of green spit. Yes, I do occasionally get spit on but no, not like this! This entry was posted in Alpacas and Farm Life and tagged Agriculture and Forestry, alpaca, Alpaca fiber, alpacas, Business, Camelids, farm, farming, fiber, fiber art, hand spun, wool, yarn. Bookmark the permalink. ← To dye or not to dye………..
Oh my! lol! Sugar Ray obviously needs to sharpen his listening skills! ahahah, this photo is priceless! What a mess, and what a persistent male you’ve got!